Why Go with a Wrought Iron Fence? A wrought iron fence is a classic choice for those looking for a strong, well-made fence. Whether you are choosing the fencing material for your charming new cottage or your brand new business, there are so many materials to sort through it can seem almost impossible to choose. Should you go with a traditional wooden white picket fence or a cost-effective chain link? Wrought iron is a fantastic, elegant, and timeless choice for your new fence. 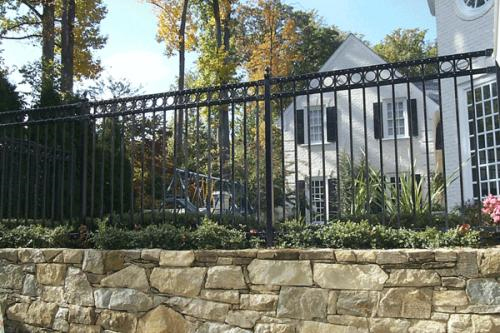 Here are some of the best reasons that a wrought iron fence might be right for you! While many types of fencing materials are billed as durable and strong, they have almost nothing compared to wrought iron fencing! Wrought iron is very durable and long lasting. They can stand up to being installed in high traffic areas and a lot of use, so they can make great options for high-security fencing or commercial fencing. They also stand up beautifully to years of daily use, so you don’t need to worry about replacing an iron fence anytime soon. Wrought iron fencing provides not only the natural protection that any fencing would, but also the additional historic protection of wrought iron. Traditionally, wrought iron fences were used to ward off criminal activity because they are just about impossible to penetrate but also allow the person on the inside of the fence to see the activity on the outside. This makes wrought iron fencing a wonderful choice for residential or commercial properties that need a little extra security. A wrought iron fence allows for a surprising number of customization options. Ornamental wrought iron fencing or gates can be manufactured in whatever style or design you like. They can even incorporate particular symbols or decorative flourishes that have a special meaning to you. This entry was posted on Thursday, December 1st, 2016 at 8:05 pm. Both comments and pings are currently closed.